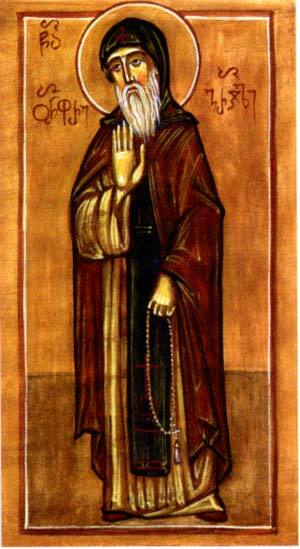 Saint Onuphrius of Gareji (Otar Machutadze in the world) lived and labored in the 18th century. He was a Kartlian aristocrat famed for his wealth, hospitality, and charity. His faithful wife consented and permitted him to go in peace. Otar traveled with his two eldest sons to Tbilisi, blessed them, and bade them farewell for the last time. Then he set off for the David-Gareji Monastery, which at that time was led by the kindhearted superior Archimandrite Herman. Archimandrite Herman received Otar with great joy, and after a short time he tonsured him a monk with the name Onuphrius. Blessed Onuphrius was a peaceful, humble and obedient man and a tireless ascetic. He would keep vigil through the night, and after the morning prayers he would go down to the ravine and continue to chant psalms, shedding tears over his past transgressions. He ate just one meal a day of bread and water, after the hour of Vespers. Once the Dagestanis attacked the David-Gareji Monastery, plundered the church, and took captive several monks including Onuphrius, the priests Maxime and Ioakime, and four deacons. Onuphrius was the oldest among them. The unbelievers planned to stab him to death, but the Lord protected him from their evil scheme. According to the will of the All-mercifulGod, Onuphrius was freed and returned to the monastery. The brotherhood was impoverished after the invasion, so Archimandrite Herman sent St. Onuphrius on a mission to solicit alms. It was difficult for St. Onuphrius to depart from the monastery, but he unquestioningly obeyed the will of his superior: the former aristocrat began to walk from door to door, begging for charity. At Tskhinvali in Samachablo St. Onuphrius attracted the attention of a crowd of people leading a young, demon-possessed man. The saint approached them and discovered that they were bringing the young man to a fortuneteller for help. The young man’s mother fell on her knees before him, begging for help, but St. Onuphrius raised her up and proclaimed: “I have come bearing earth from the grave of St. David of Gareji. This will help your son!” He dissolved a pinch of the earth in water and gave it to the young man to drink, and he was immediately healed. St. Onuphrius took with him his youngest son, John, and returned to the monastery with a great quantity of provisions. Once a certain Arab with a wounded eye came to the monastery seeking help. St. Onuphrius washed his eye in water from the holy spring of David-Gareji, and he was immediately healed. Later St. Onuphrius desired to be tonsured into the great schema. The superior was hesitant, and told Onuphrius to remain for twenty or thirty days at the grave of St. David praying and supplicating God to reveal His will. The saint remained there in prayer, and after thirty days God revealed to the abbot that Fr. Onuphrius was truly worthy of this honor. Then Schemamonk Onuphrius gave a vow of silence and began to sleep on a tattered mat. Under his clothing he wore a heavy chain, and he left his cell only to attend the divine services. Sensing that the end of his days was approaching, St. Onuphrius partook of the Holy Gifts and, eighteen days later, on the Feast of Theophany, fell asleep in the Lord. St. Onuphrius was buried on the south side of the grave of St. David of Gareji, near the altar window.